Now onto the outfit. In all honestly it happened completely by surprise. I had been getting pretty bored of wearing the same outfits week after week & just wanted to try something different but had no money to afford new clothes. If I'm honest I'm actually a massive cheap skate. I rarely pay full price for anything, and this outfit is no exception. Since the full circle midi skirt came back into fashion over summer I was totally obsessed and just knew I had to buy one. I originally saw this skirt in Topshop right at the start of the season and instantly fell in love. Unfortunately at £45 I couldn't justify the purchase and left it. Later when the Topshop sale began I instantly ran for the rails and to my delight there it was, waiting for me to purchase., and at a bargain of just £20. I honestly don't think I've ever felt so much joy when making a purchase as I did with this. Needless to say it's definitely one of my favourite pieces and I literally wear it to death. This shirt was also a complete steal. At just £7 I just couldn't say no. I was really drawn to the floral detailing and I liked that it was cotton rather than chiffon.Generally I'm not really a shirt kind of girl as I always have trouble getting it to fit in a certain area unless I get a size 20, which then makes me look massive. However this one fits like a dream and is super comfortable. 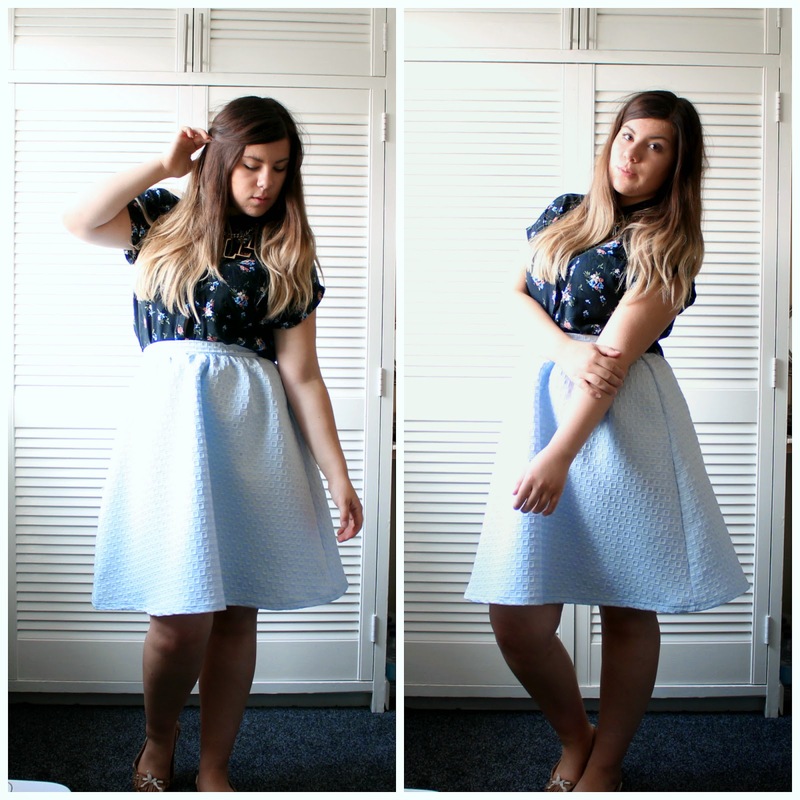 I decided to match the skirt with the subtle hint of blue in the shirt to tie it all together. 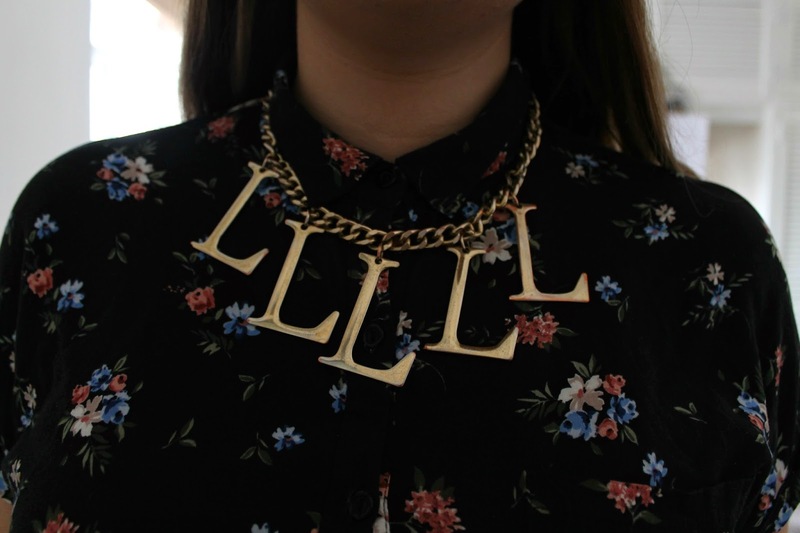 Can we all just stop for a second and appreciate how amazing my necklace is. I mean literally....it's beautiful. I actually first saw this when the goddess that is Leah Mcfall wore it on 'The Voice UK' last year. The next day I was straight in my local Topshop scouring the jewellry section for it and pretty much snatched it up as soon I as I saw it. I always get asked what the L's mean & generally I leave it to their own interpretation...I've had some pretty weird suggestions. Now it definitely wasn't the cheapest piece of jewellry I've ever bought, never the less I knew that it was going to be a staple piece in my collection & feel it was well worth the investment. I completed the look with my classic camel flats as I think that the compliment the rest of the outfit nicely. I love the 1940's house wife feel of this outfit and the addition of the statement necklace really helps to modernise the look as a whole. There's just something about the classic skirt & shirt look that I just can't get enough of. Not only is it timeless but I think it makes me look more mature ( in a good way). I've actually worn this outfit on several occasions recently, including a picnic in the park and a reunion brunch. Both of which I feel it was perfect for. So what do you think the L's stand for? Leave you suggestion below!